Jake wants to know what are those things sitting on the bench? Hmmph, doesn't look like like anything I want to eat. That's the last of the celery root for the year. They were getting too big and taking up valuable space so out they came. Ranging from just over 4 pounds to nearly 5 pounds, those babies total 18.25 pounds. It's a good thing we love celery root around here and that it keeps really well in the fridge. 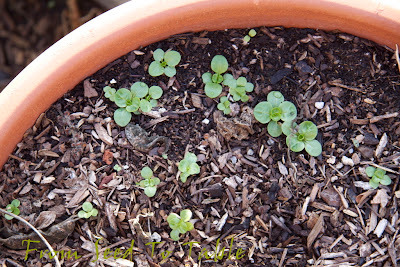 That was the only harvest for the week and the space where those were growing was almost immediately replanted with Ear of the Devil and Sweetie Baby Romaine lettuce seedlings that I had started in pots. This harvest pushed my total harvests for the year over the 700 pound mark to 710 lb., 7.25 oz. 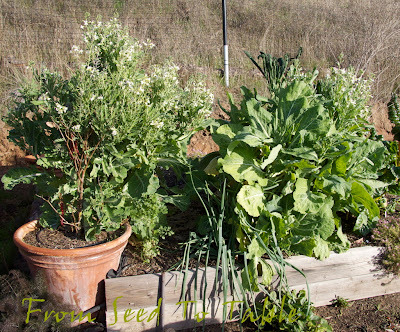 Harvest Monday is hosted by Daphne on her blog Daphne's Dandelions, head on over there to check out other garden bloggers harvests or show off your own. And now, the pepper survival report. Every single pepper plant from the raised bed ended up in the compost bin. 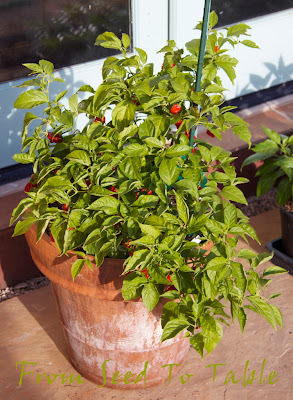 But I also grew a lot of peppers in pots and in a bed near the house. In this corner, bleah, it looks pretty bad, but I am actually optimistic about a couple of the baccatum plants, I've seen them regrow from from such states before. The plant in the large terra cotta pot in the corner (Aji Santa Cruz) has dropped all its leaves but most of the rest of the plant is ok.
like over here by the house. 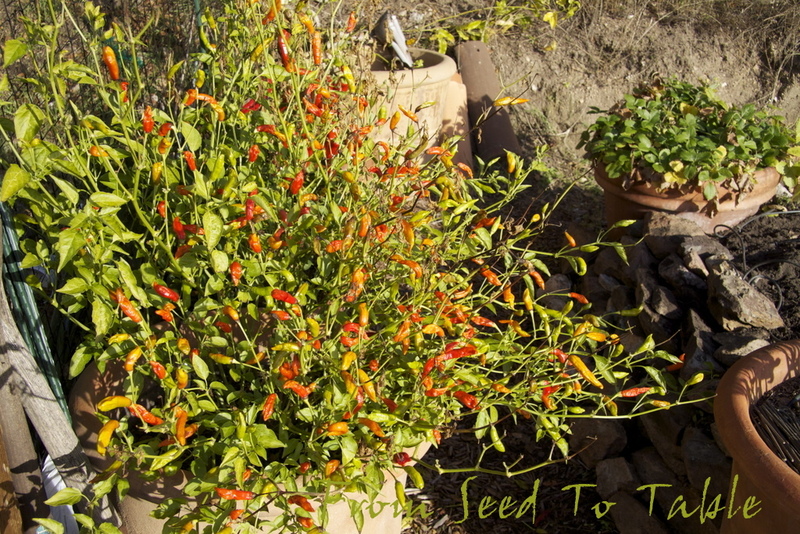 There's a big leggy Manzano pepper (Capsicum pubescens) which is one of the most cold tolerant pepper species. 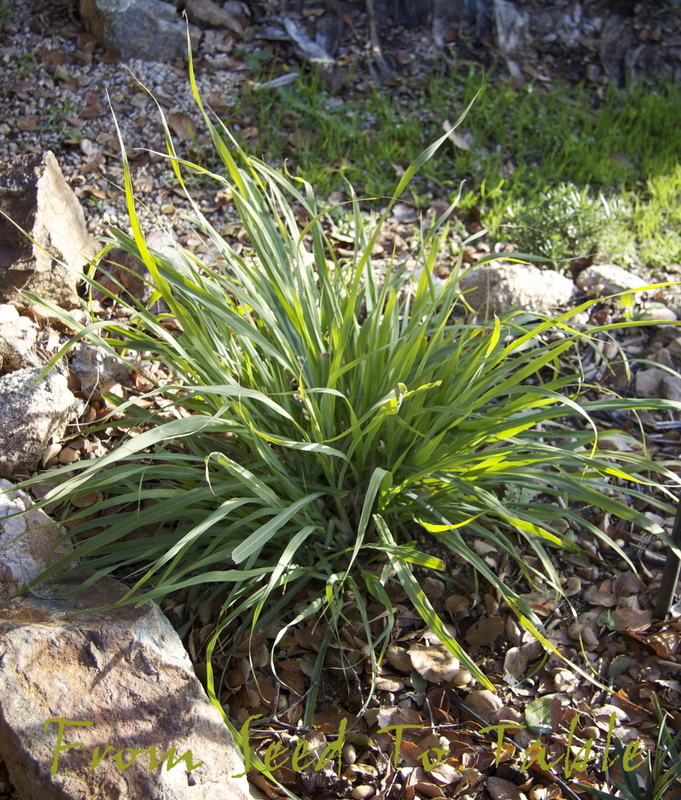 Plants can survive for years in mild climates. 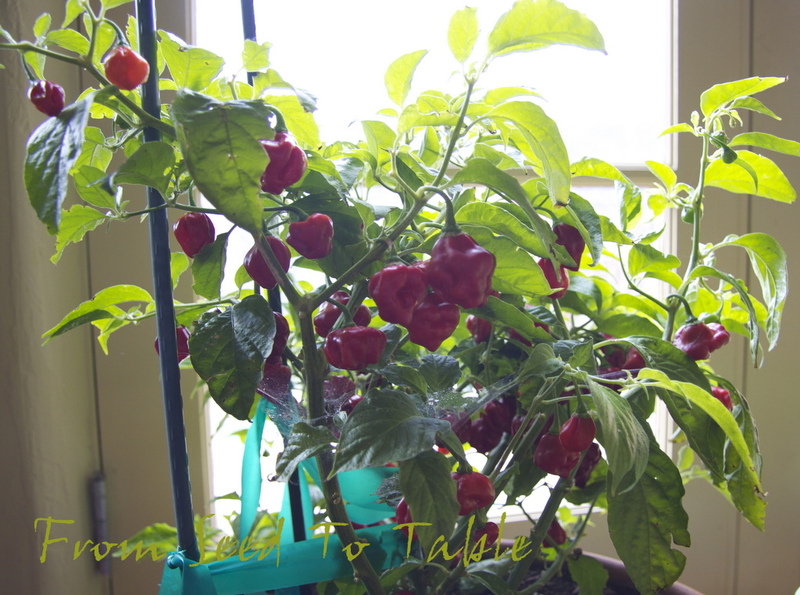 And yet one more pot with another chinense variety of pepper, one of the Puerto Ricans, I don't remember which. 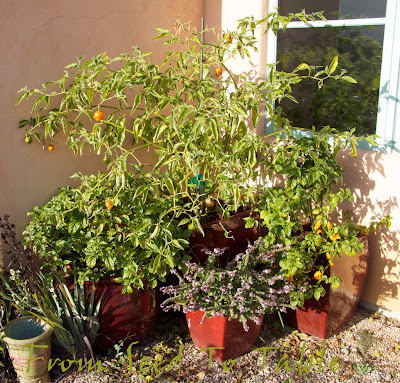 I didn't cover any of the plants in that corner, the only protection they had was their proximity to the house. It probably helped a lot that that corner is south facing so the walls warmed up during the day and kept the area a bit warmer through the night. 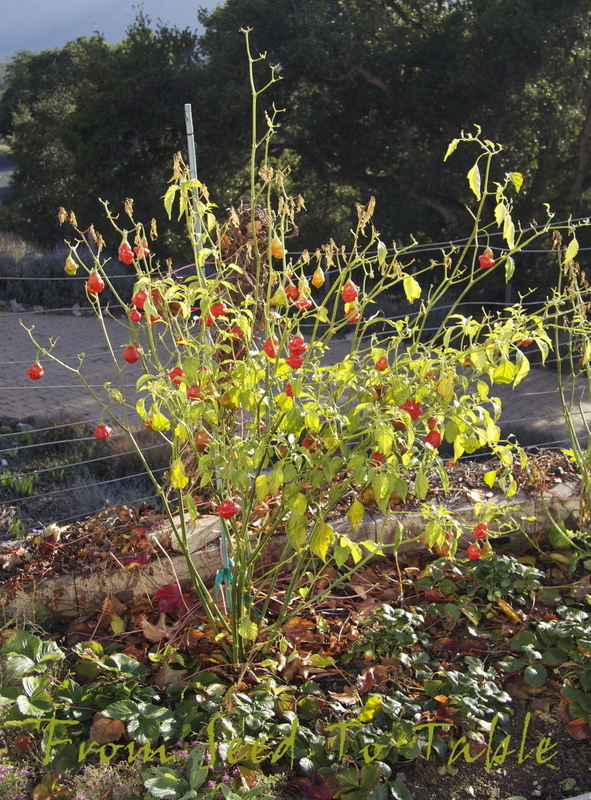 Also in front of the house but not as close is a bed where I planted a few more baccatum peppers. 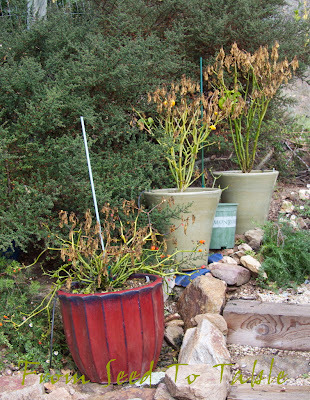 All of these plants are still very much alive even though most of them have dropped most of their leaves. 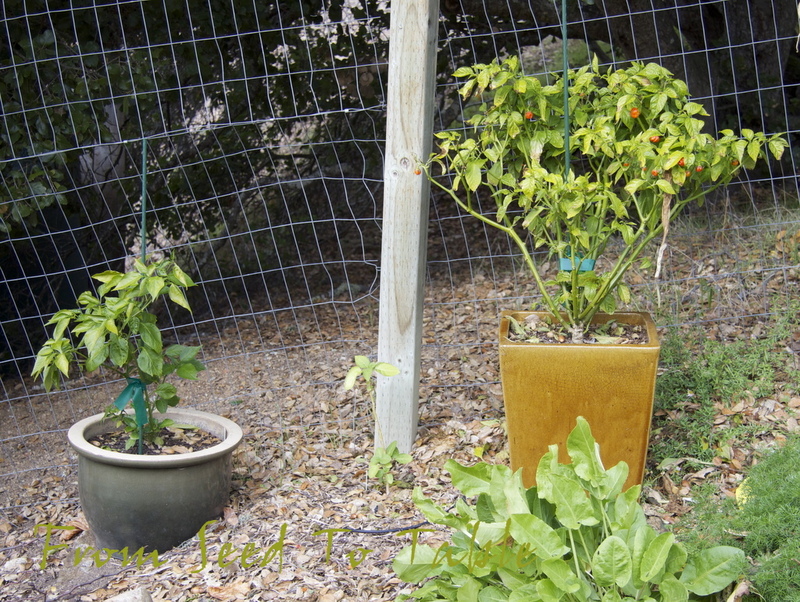 It's interesting to me that the plant that I left a lot of peppers on has retained the most leaves. 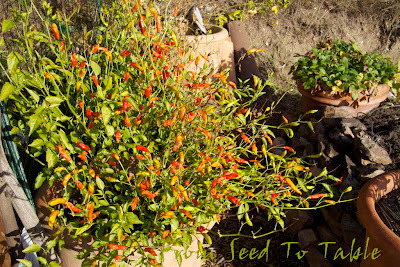 My experiment with overwintering pepper plants outdoors continues out back. The next two plants are sitting under the canopy of an oak tree and the overhead protection seems to have spared them the worst effects of the freezing nights. 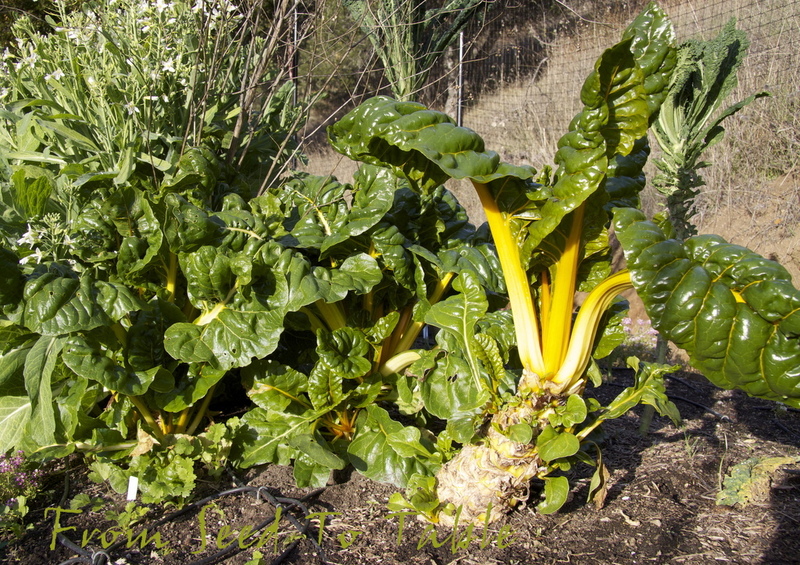 The plant on the left is a baccatum and the other is a chinense. 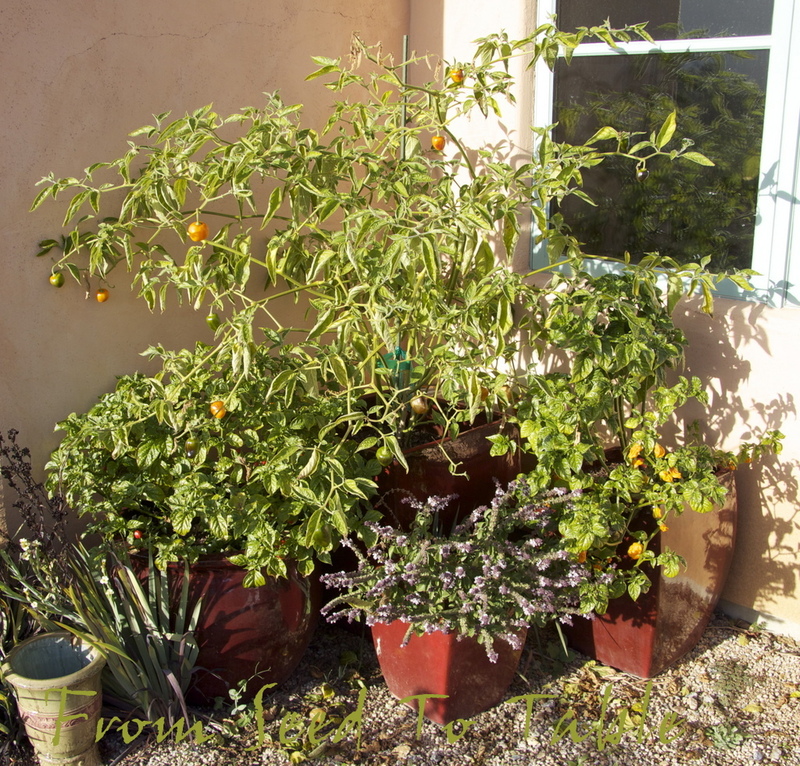 Close by, these two chinense plants had only partial overhead protection. 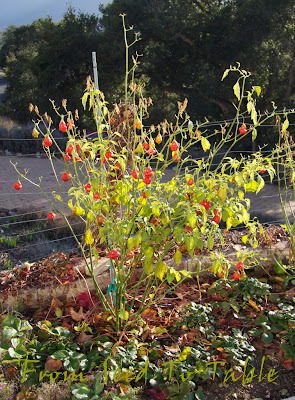 And over here these chinense plants had no overhead protection. This Rocotillo plant has it easy, it gets to stay inside at night and on cold days. 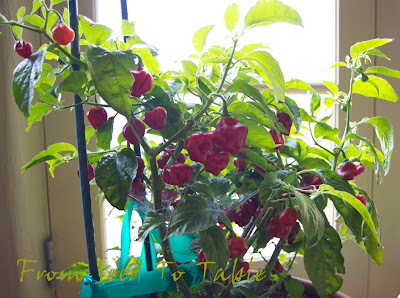 This was my favorite of all the chinense species plants that I grew this year. I love the flavor and it was incredibly productive. 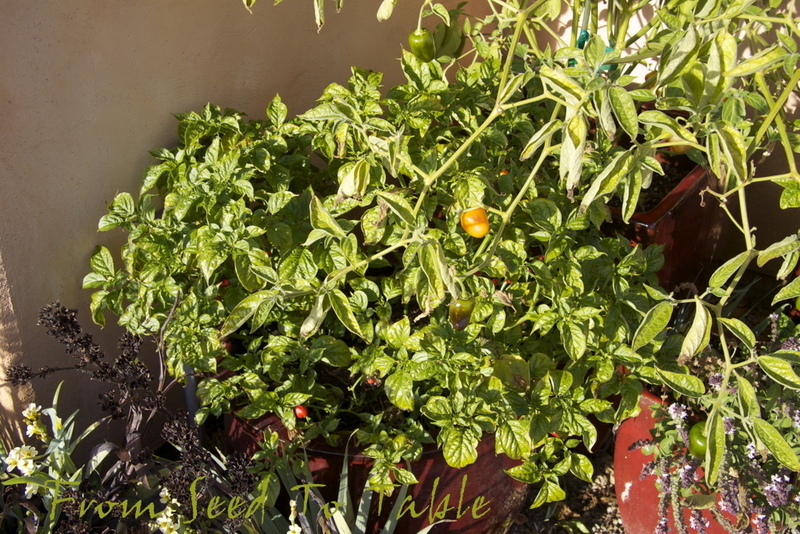 It's hard to see in this photo, but it's loaded with ripe peppers. Back in July I received the seeds of a couple of unusual pepper varieties that I received in exchanges and I couldn't resist sowing some even though it was far too late in the season to get any mature peppers this year. 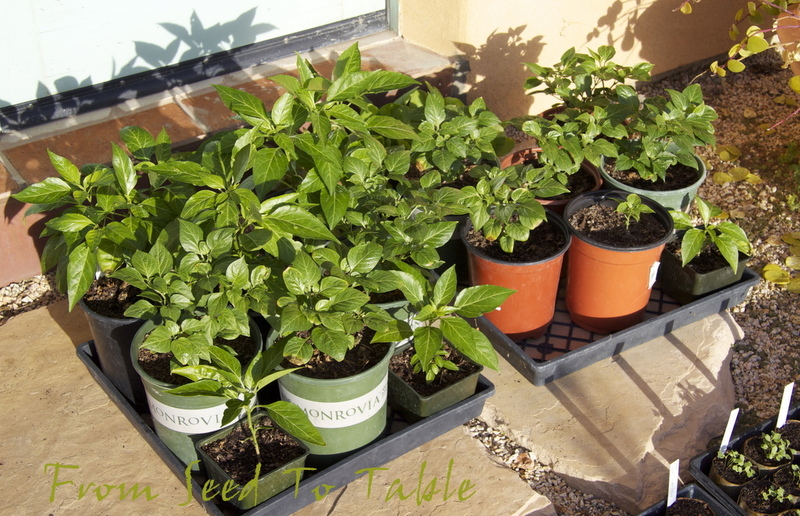 Here they are basking in the sun of a mild December day. I've been keeping them indoors at night and on cold days. These are Pimenta Biquinho, a sweet chinense pepper from Brazil, and Pima Rodrigues, a spicy annuum pepper from the island of Rodrigues in the Indian Ocean. Some of the Biquinhos have flowers already, although none of them have set. 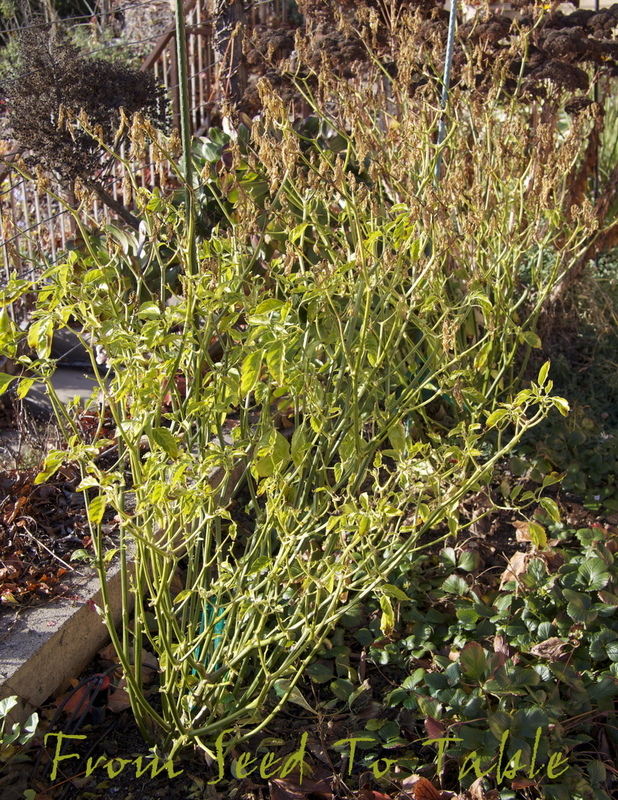 I hope that a lot of these plants make it through the winter, it depends on how many more freezing nights we get and whether or not any of the plants succumb to fungal diseases. And those new babies are sporting a population of aphids now. One application of Pyganic, an OMRI approved pyrethrin insecticide, took care of a lot of them, but it looks like I might have to give them another application. 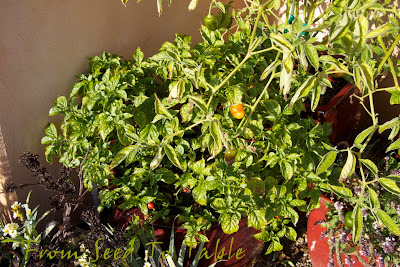 It has been quite a while since I last did a garden tour post. 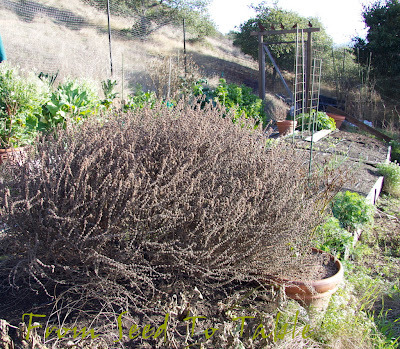 The last tour, two months ago, showed what happens when you neglect the garden for about a month. 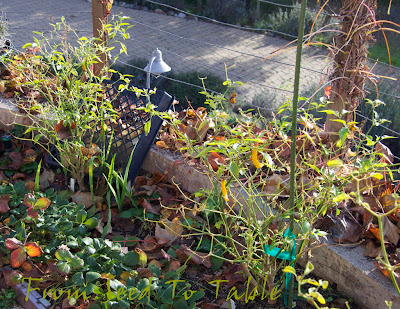 This time we get to see the garden one week before the winter solstice (already, where did the year go???). 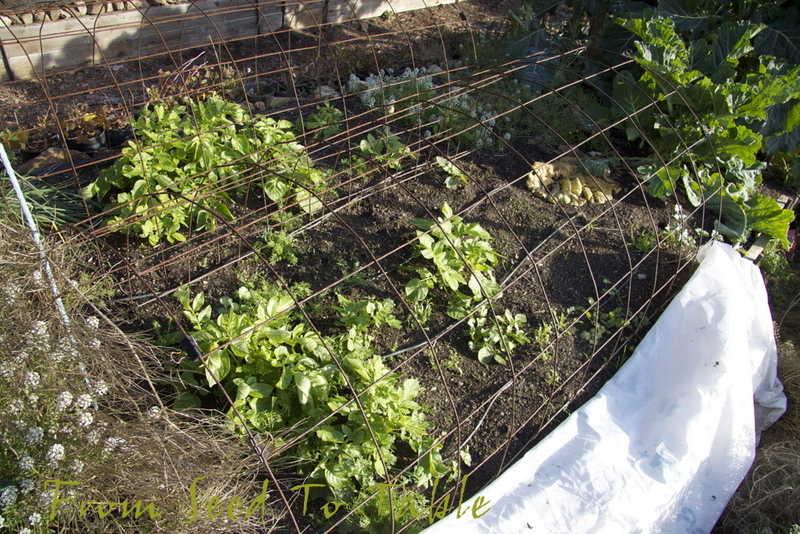 The bed shown above was home to all the tomatoes and many of the peppers that I grew this year. 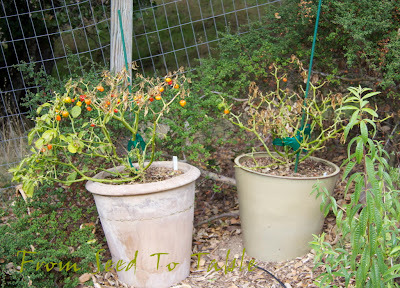 A lot of the peppers performed quite poorly because of root competition from the oak trees that grow outside the garden. The tomatoes still produced but the plants didn't grow as vigorously as they should have. So I spent a good chunk of time during the past week completely digging the bed except for one small corner where there are some favas already growing that I didn't have the heart (or stamina) to pull out. The oak roots were a thick tangled mass throughout the end of the bed from where the photo was taken and that was where the peppers suffered the most. They started to thin out about half way down the bed (10 feet!) and by the end of the bed they were quite thin. I dug down to the bottom of the bed as far as the gopher barrier to sever the invading roots. I probably moved each shovelful of soil at least twice as I worked my way down the bed. The biggest roots are going into the compost pile because they are quite woody and will tie up a lot of nitrogen as they slowly decompose. 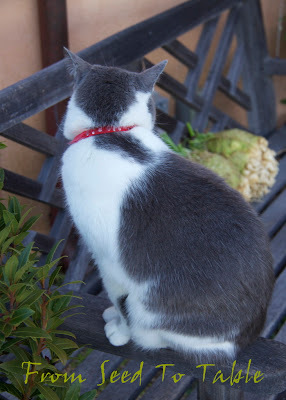 It was exhausting work for this not so spring chicken of a gardener, but hey, the battle to keep the holiday pounds off has been a lot easier! 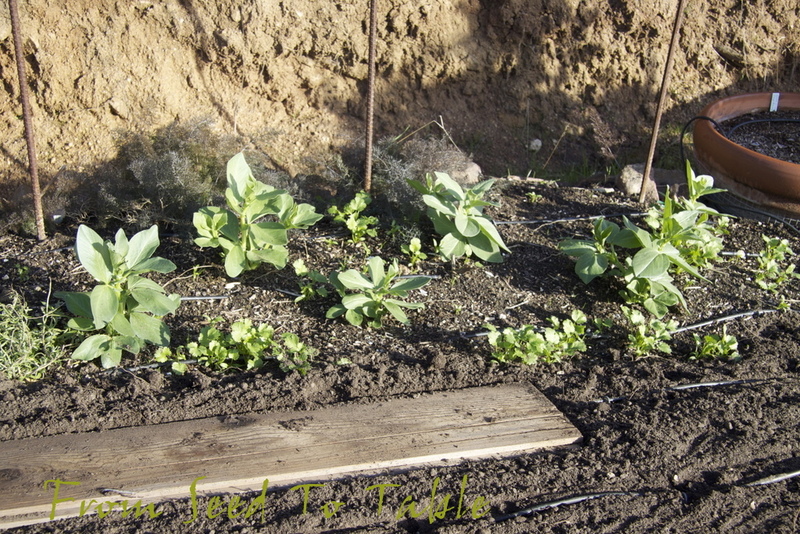 I planted the rest of the bed with the favas that I grew last year, Extra Precocce Bianco and Extra Precocce Violetto. Shown below are the Extra Precocce Biancos that I planted earlier after I pulled the tomato plants in that area. 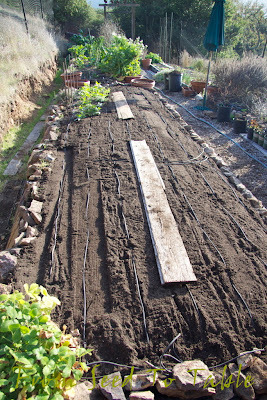 Now I need to dig around the outside of the bed to sever the oak roots where they enter the bed... Later, after we get more rain that will soften the rock hard native soil. On the other side of the main path you can see the volunteer Portuguese Dairyman's kale that grew where the parent plants grew last year. I've got lots of seeds to share if anyone is interested. 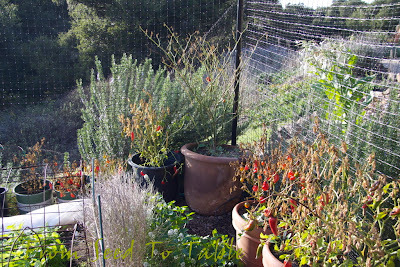 And you can see the eggplant that I've not yet cleaned out of the garden. 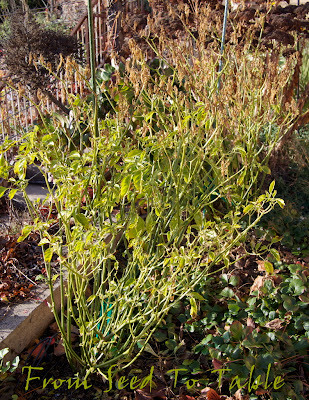 Those plants produced until we had a killing freeze just before Thanksgiving. 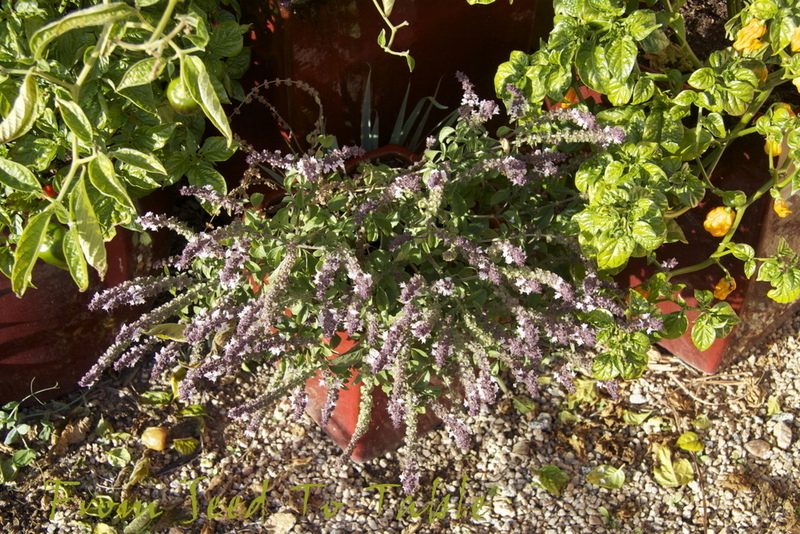 Another victim of the freeze that I've not yet pulled out was the African Blue Basil. It still has a bit of life showing down at the crown so I may leave it and see what happens, I've seen plants just as crispy come back to life. In the meantime it remains incredibly fragrant, every time I brush past it the aroma perfumes the air. On the other side of the kale is the spot where I had planted potatoes, pulled them out when the vole/mole/whatever started rooting around in that area, and I then replanted because the spot was empty anyway.... Well, the potatoes are growing and even survived a couple of nights when the temperature dropped to 27F for a few hours because I had the foresight to drape some frost cloth over the plants. That was actually a somewhat half hearted effort, I didn't even completely enclose the tunnels, but just having overhead protection was enough. Can you see the dead twiggy stuff in the left bottom corner of the photo above? That was the little patch of chamomile that produce enough flowers over the course of the summer to keep me drinking tea all winter. Surprise, surprise, the offspring are already volunteering in the potato patch. I had no idea that the plants would grow in the winter! Look at that healthy looking plant down below. 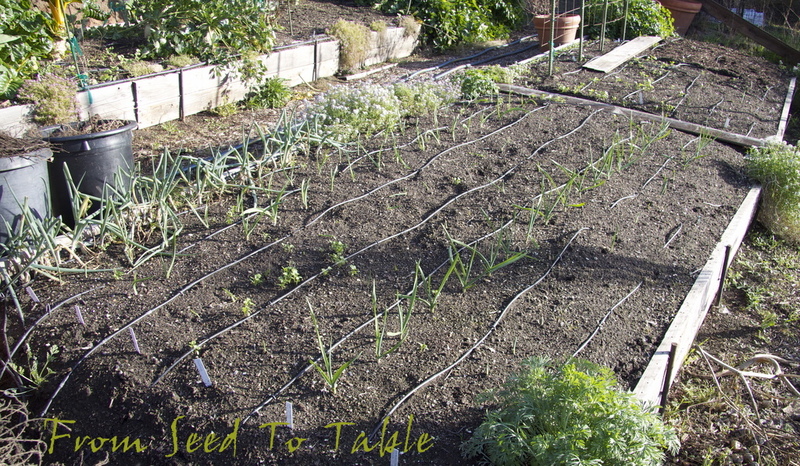 The next bed down is where I've planted garlic. Eight varieties this year, all new for me. There's Rose du Var and S&H Silver, both softneck silverskins. And 2 softneck artichoke types, Aglio Blanco and Island Star. I chose 4 hard neck varieties (gotta have those scapes), Blanak and Persian Star (both purple stripe varieties), and Japanese and Thai Purple (asiatic varieties). The far end of this bed has been seeded with Monticello poppies and I've left a couple of trellises in place where I'm going to experiment with winter grown sugar snap peas. 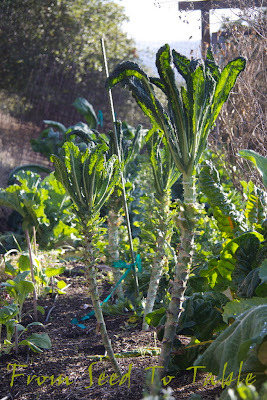 Across the way the bolting Couve Tronchuda (Portuguese cabbage) that I left to bloom for the beneficial insects. And a few replacement baby Couve Tronchuda that I hope will grow enough this winter to provide leaves to go into a few batches of Caldo Verde. 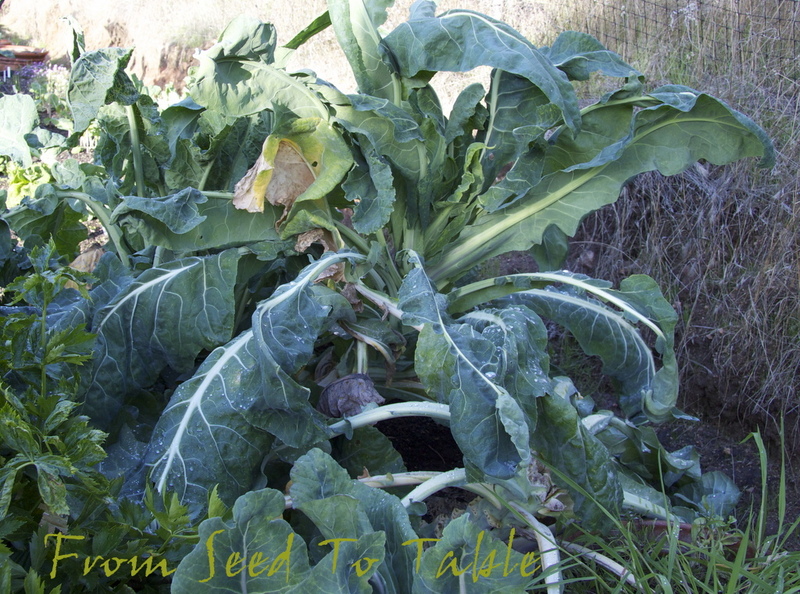 Is it any wonder that one of the common names for the kale shown above is Palm Tree Kale? 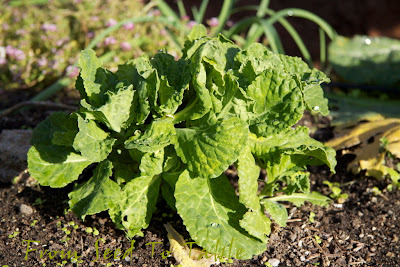 It's also know as Cavolo Nero, Tuscan Kale, Lacinato Kale, and Dino Kale and I'm sure there's other names for it as well. Whatever name it goes by, it is my all time favorite kale. Romanesco broccoli plants. 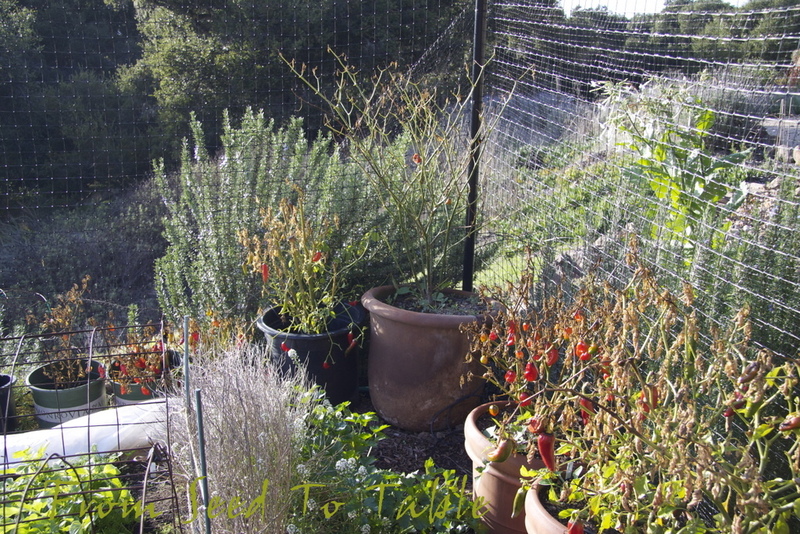 You can see the plant that I've already harvested from and two large plants behind that I hope will produce proper heads. 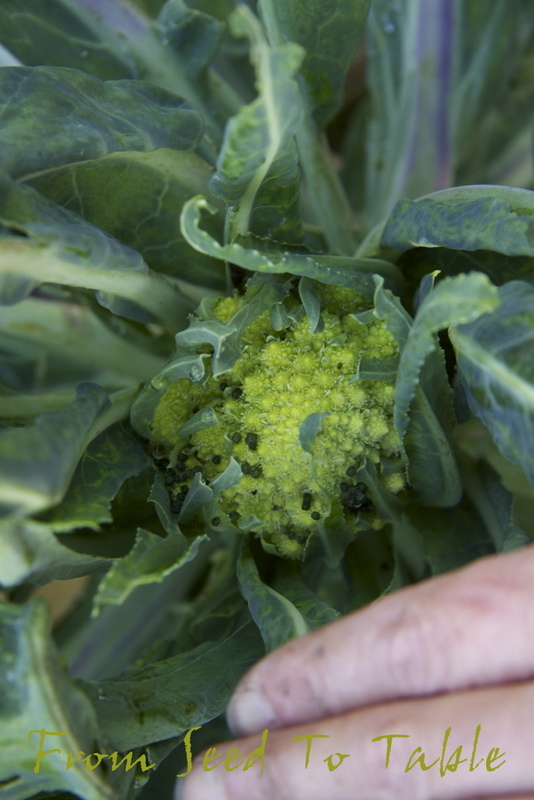 And below is shown is head forming on a smaller plant (complete with caterpillar poop). This runty head can size up a bit more. 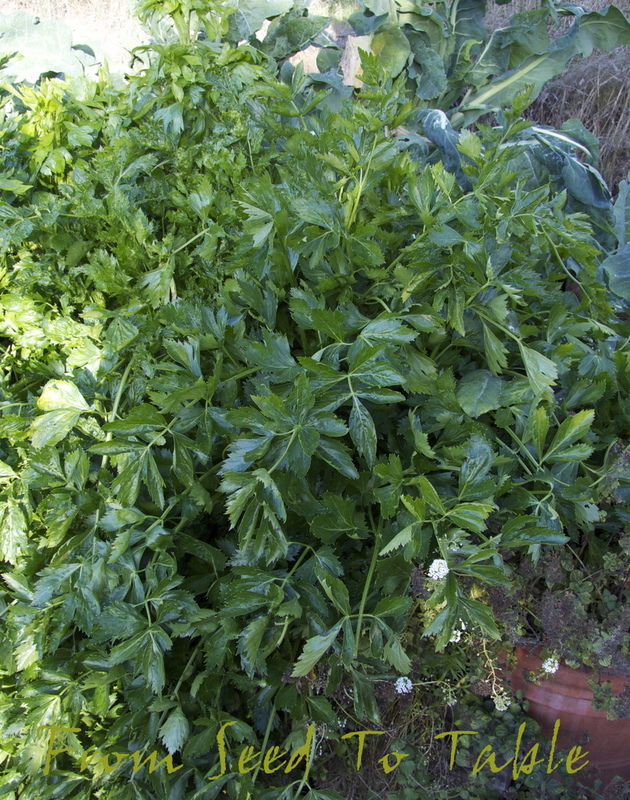 The plant above is Hollow Pipe of Malines cutting celery (leaf celery). This is the last time I'm growing it, I find the flavor to be too strong and somewhat bitter. 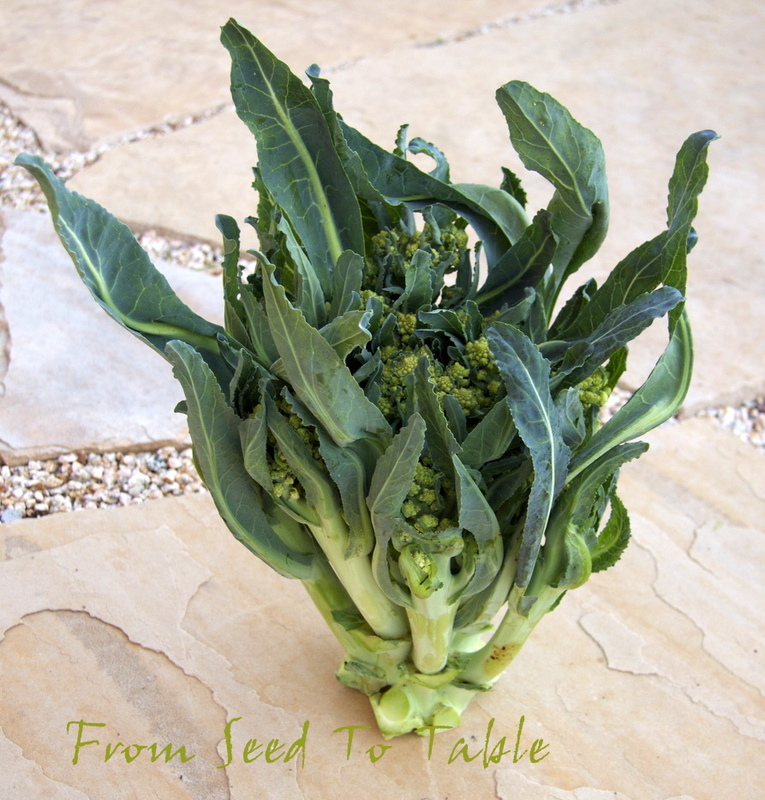 The stump of the Testa di Ferro savoy cabbage is sprouting. I read somewhere that sometimes cabbage plants can grow a new head from a side shoot so I've left this plant to see what happens. 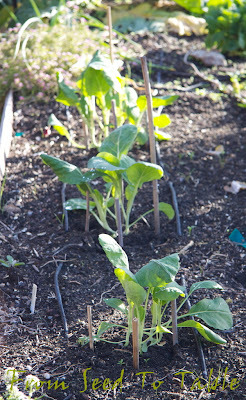 Look closely and you can see bright green sprouts of volunteering Golden Corn Salad coming up around the cabbage. 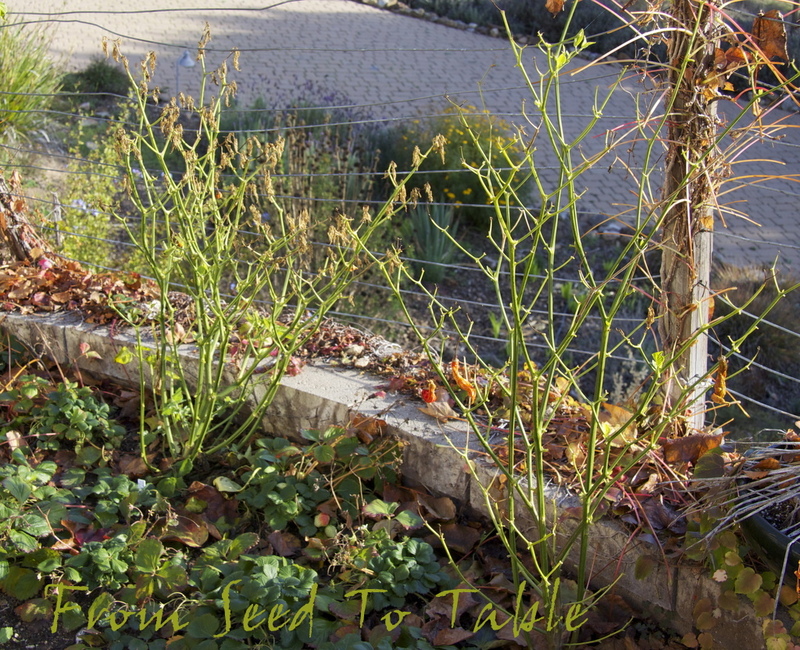 The corn salad grew in this location last year and I let it go to seed and now it's volunteering all over this bed. 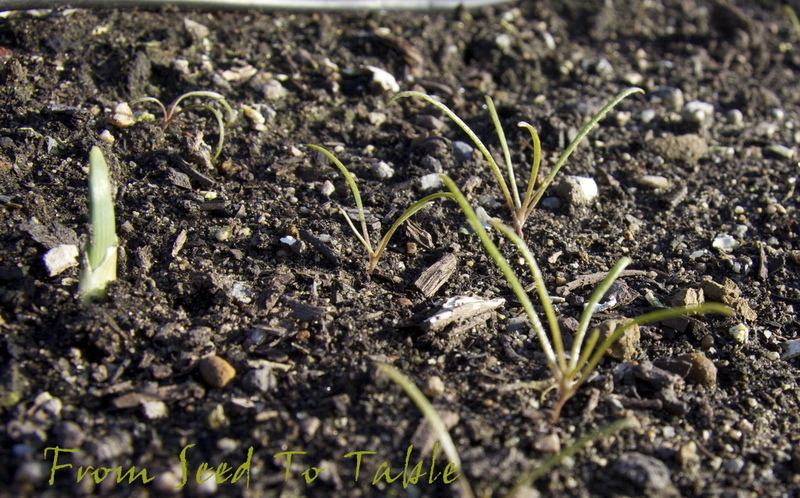 I had always wondered why the corn salad waited until winter to sprout and then I learned from a gardener in Mississippi whom I sent some seeds to that corn salad (mache) won't germinate if the soil temperature is too warm (thanks Jim!). 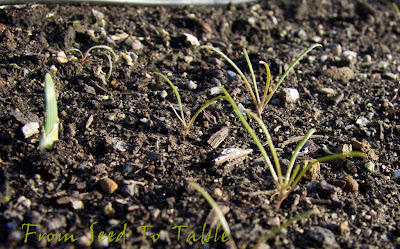 Corn salad transplants easily so I'll move some of the seedlings to a spot where they have room to grow. 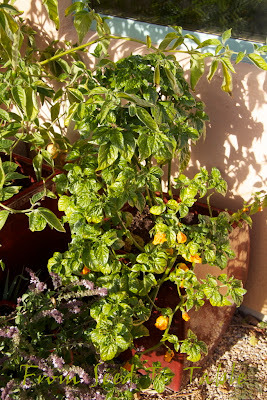 And below is some Gala mache that grew in this pot last year and went to seed. 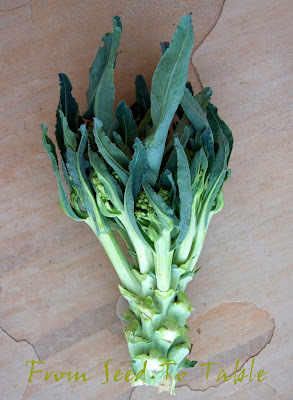 I love veggies that perpetuate themselves if given the chance. Diamante celery root in need of harvesting, which happened after the photo shoot. Come back on Monday to find out what this root and its 3 companions weighed in at. 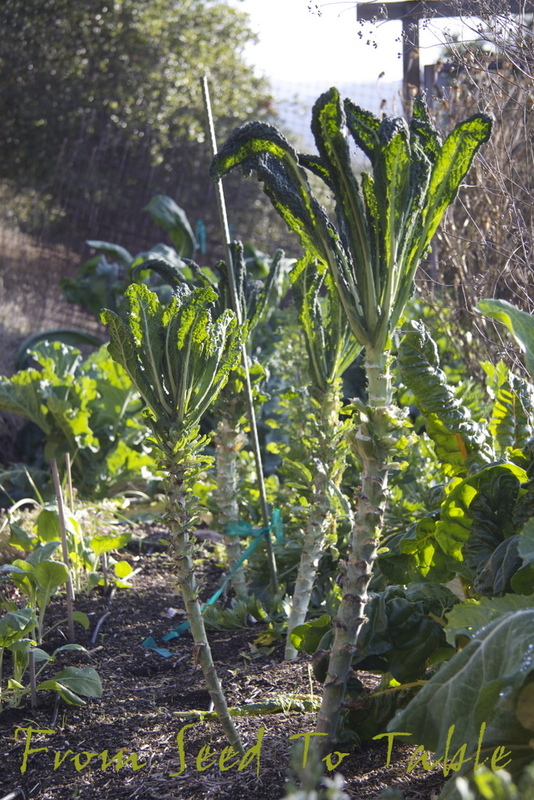 Golden chard, unfazed by overnight freezing temperatures. Thank goodness the cold weather slows the growth rate down. 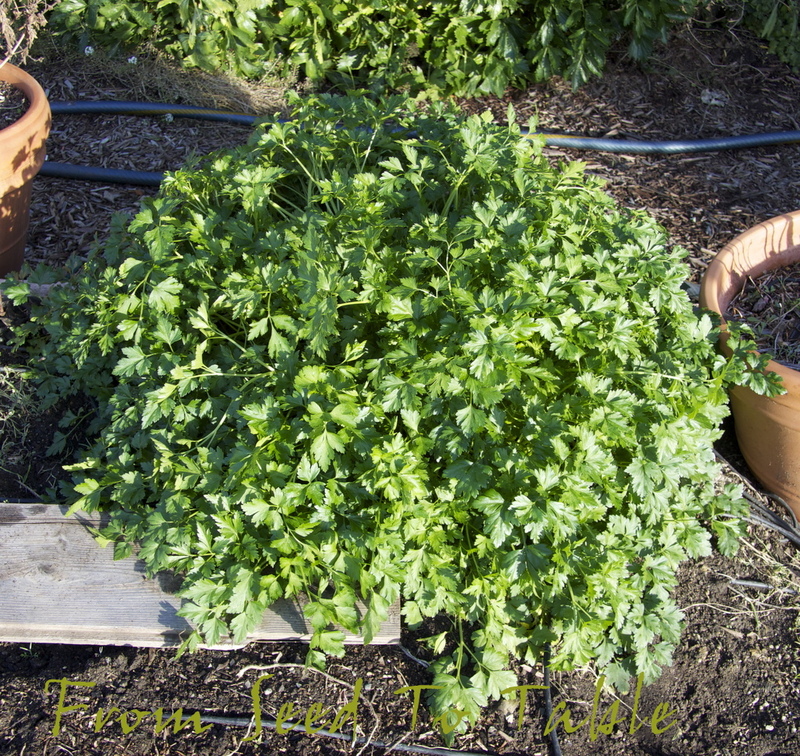 Turkish parsley, a flat leaf variety similar to Italian parsley but with smaller leaves that are a bit more tender. I got the seeds for this variety from Peace Seedlings, they offer it direct when their website is up (only part of the year) and they also offer it through the Seed Savers Exchange annual yearbook. Another welcome winter volunteer is the native Miner's Lettuce (Claytonia perfoliata). 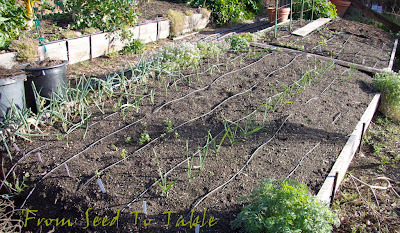 These plants are coming up in the garlic bed and will be harvested young before they compete too much with the garlic. 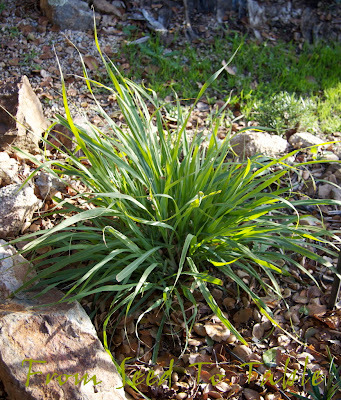 And outside the garden, in the land of giant antlered rats, um deer, one of the lone survivors in the what-herbs-won't-they-eat experiment, lemongrass! 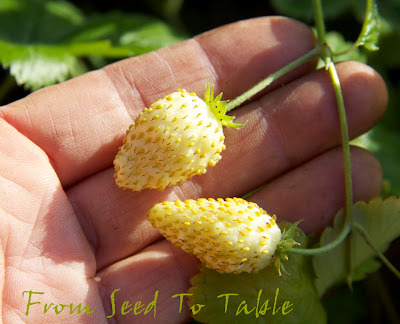 But wait, there's one more surprise from the garden, the Yellow Wonder strawberries are still producing sweet berries, a tasty reward for all that hard labor. 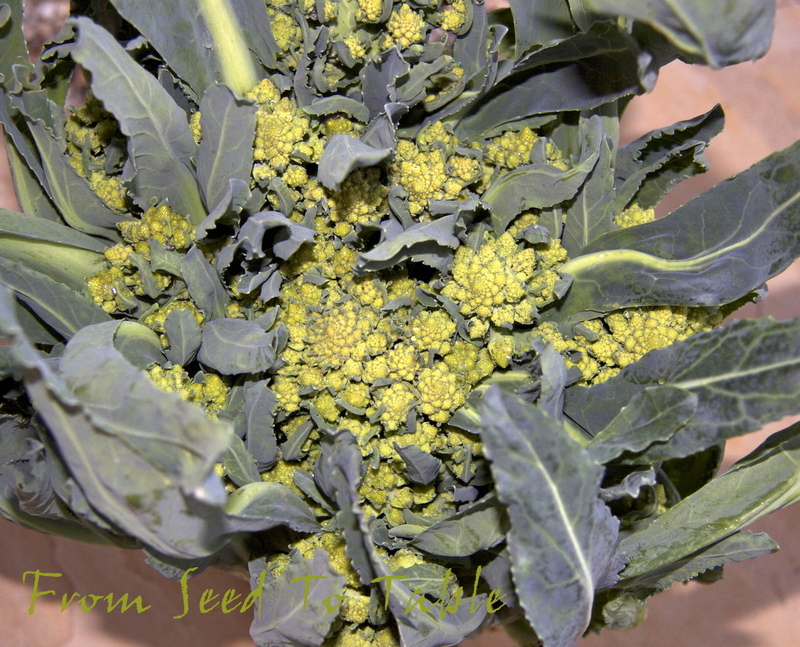 Harvest Monday is here again and I've got a fat funky looking but still delicious head of Romanesco broccoli to show off. 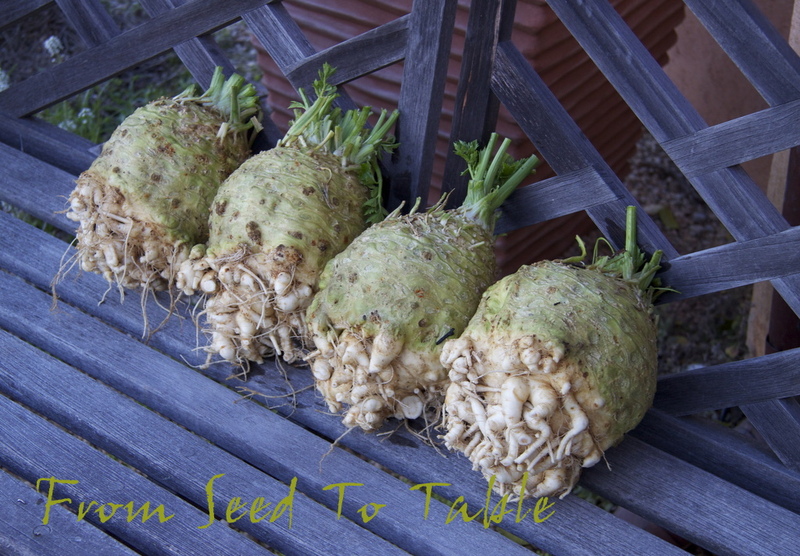 This head started to form early, one other plant at the moment is showing signs of one small head developing, and the other two plants in the garden seem to be on track to produce late winter or early spring heads as planned (I hope). The photos aren't the best since the low light required me to use the flash, but you'll still get an idea of how this head came out. There's lots of leaves growing up around each floret in the head so the head doesn't look typical. Each floret also has a rather long stem. I cut off a number of florets from the bottom of the "head" before I started taking photographs. The florets that were cut off of this head weighed in at 1 1/2 pounds. 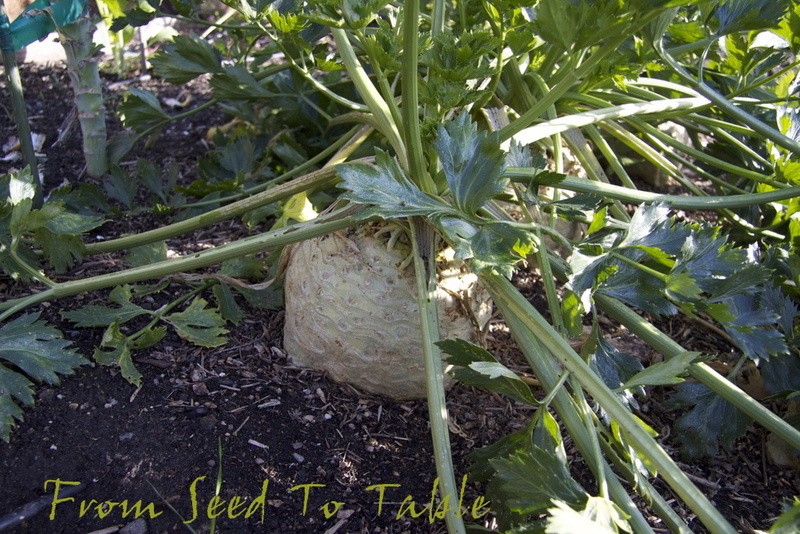 After cutting the main stem down some more the head weighed in at just shy of 4 pounds. Now I've got the challenge of eating 5 pounds of Romanesco, but fortunately it keeps quite well in the refrigerator. 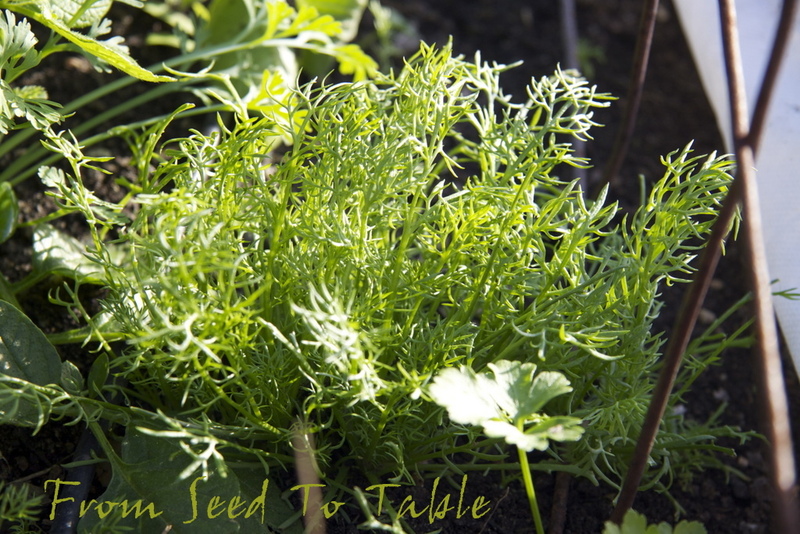 The first florets were blanched and shocked to get rid of the aphids that had taken up residence, then I peeled the stems and cut it all into chunks and braised it with garlic, capers, and mild pepper flakes. 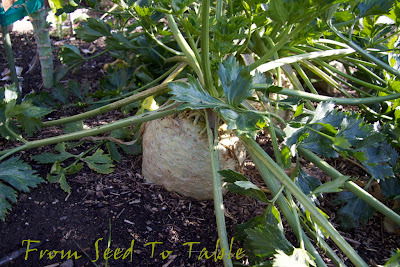 I think I'll make a pureed soup with some of the rest of it, that will use up a big chunk. The only other harvests for the week were some Lacinato and Portuguese kales that I used to make kale chips for the first time. Those were good! And easy. 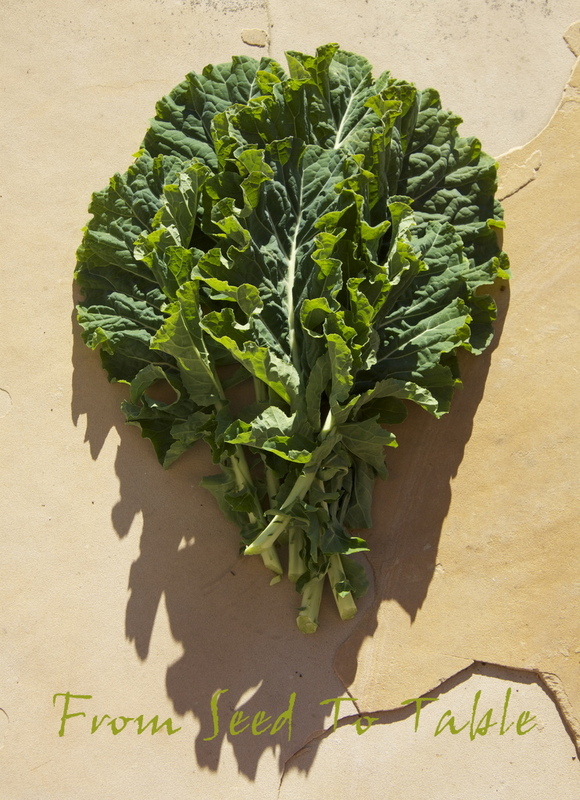 Just remove the mid ribs from the kale leaves, tear the leaves into pieces, toss with some olive oil to lightly coat the pieces, spread them out on a baking sheet and bake in a 300F oven for 30 minutes until crisp, sprinkle with salt and serve. Lacinato kale - 5.75 oz. 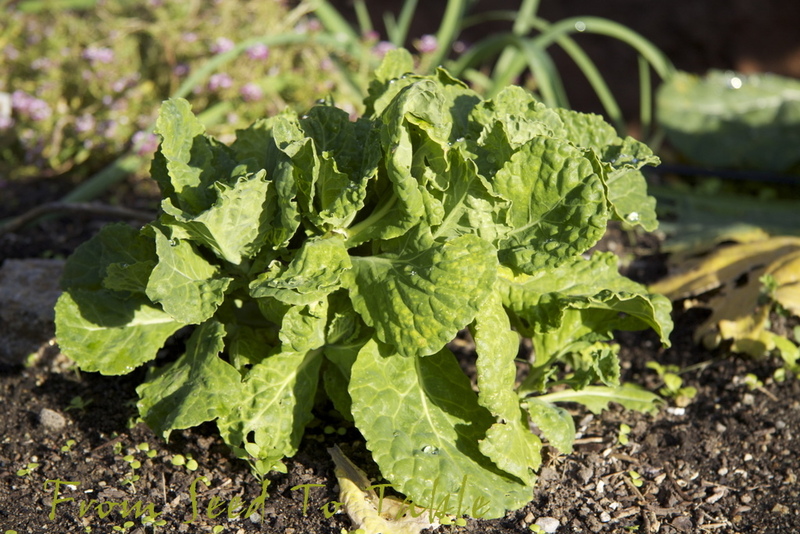 Portuguese Dairyman's kale - 6.5 oz. Romanesco broccoli - 5 lb., 6 oz. The total for the week was - 6 lb., 2.25 oz. The total for the year is - 692 lb., 3.25 oz. 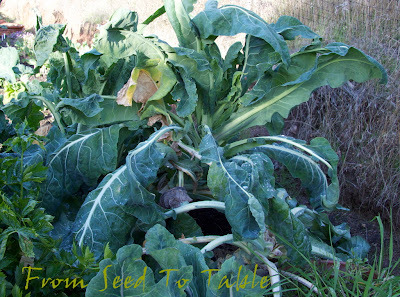 Harvest Monday is hosted by Daphne on her blog Daphne's Dandelions, head on over and check it out. 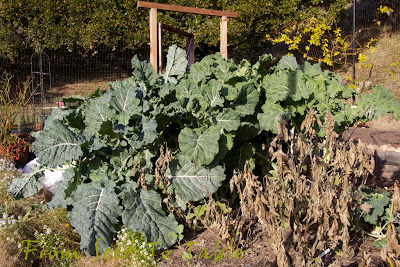 I'm glad I weighed and photographed the kale that I picked last week, otherwise I would have nothing to report for Harvest Monday! 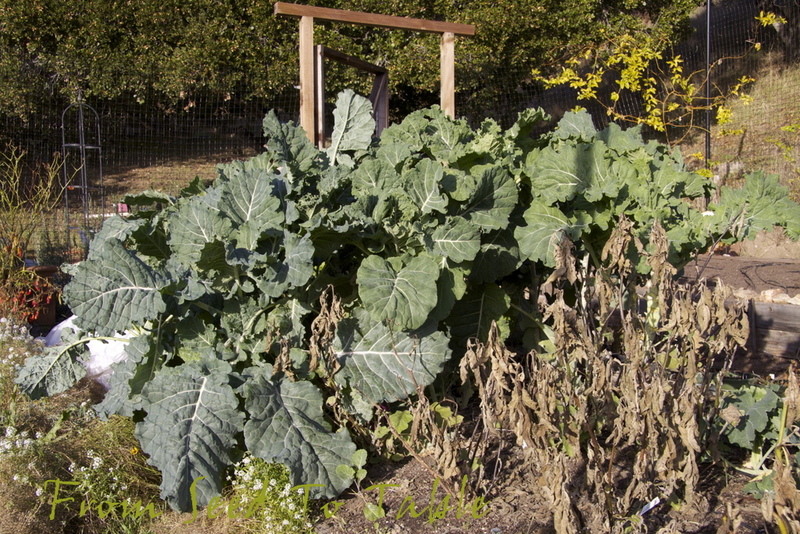 That's it for the week - 10.25 ounces of Portuguese Dairyman's Kale. I used it in soup made with turkey broth, leftover turkey, Petaluma Gold Rush beans, half ripe Christmas Bell peppers, tomato puree from the freezer and other aromatics. It was delicious and warming. That brings the total for the year up to 686 lb., 1 oz. Check out more Harvest Monday posts at Daphne's Dandelions. 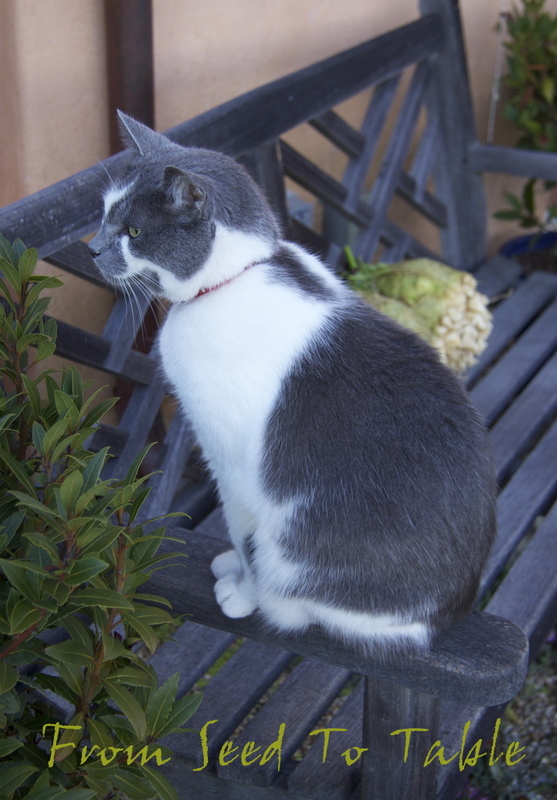 Gotta go now, the sun is out and I've got lots of catching up to do in the garden.